Federal agencies are starting to send out furlough notices like this one to unions, kicking off the budget cuts. Defense employees face up to 22 days off work without pay. The first furlough notices for government employees have gone out. 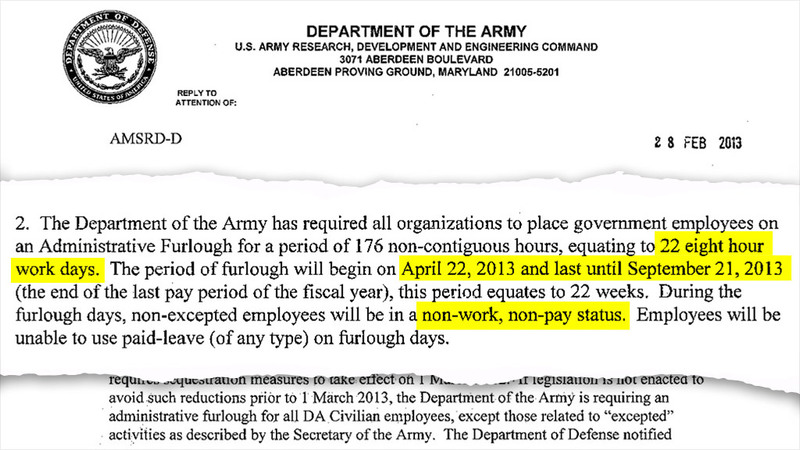 The Army has started sending out hundreds of letters to unions -- including on Feb. 28 and March 1 to the Aberdeen Proving Ground in Gunpowder, Md., as well as the Corps of Engineers in Walla Walla, Wash. -- warning that employees will be forced to stay at home without pay one day each week from April 22 through Sept. 21. Translation: A 20% pay cut for 5 months. Employees will stay at home on either a Monday or Friday. Not everybody may get to choose their days, because supervisors have to ensure that at least half the staff is available on both days. Employees won't be able to use sick leave or vacation to collect pay on furlough days. That's true for all federal worker furloughs, according to the Office of Personnel Management. President Obama signed an order Friday, which set in motion $85 billion of cuts from federal budgets this fiscal year. Many of the 2.1 million federal workers will have to go on unpaid furloughs over the next few months to hit that target by September. "Those who think the sequestration debate is just another game of Washington brinksmanship are sadly mistaken," said William R. Dougan, president of the National Federation of Federal Employees. "This is not a game. Real people will be hurt, people whose only role in this debate was choosing to serve their country." Notices are first sent to federal workers' unions, who will negotiate how and when various agencies will implement their furloughs. The 800,000-strong civilian workers at the Defense Department are among the worst hit. Many of these employees will have to give up 22 days of work without pay. The cuts will trim 13% from the defense budget between now and Sept. 30. "This furlough will be used as a means to reduce civilian workforce costs because of the across-the-board reductions in budgetary resources (sequestration)," said the note to the Washington Corps of Engineers. The Army Corps of Engineers has 35,000 employees, both civilians and military workers, who build and also safeguard the nation's dams, hydro power generators and flood controls. Aberdeen Proving Ground is one of the Army's oldest test centers, where some 21,000 civilian workers review, test, and develop military equipment and vehicles. Other agencies are also expected to start notifying their unions and employees of impending furloughs. Employees at non-defense agencies are expected to face fewer furlough days. For example, Internal Revenue Service employees have been told their furloughs would not last more than 7 days. The unions have been given a little more than a week to respond to the notices. - Have you received a termination notice from the federal government? We want to hear from you. Email us your story, and you might be included in our coverage about the forced budget cuts.